It's easy to forget how important our hands are. I know I'm not always kind to mine (or my nails, for that matter) but they do deserve a bit of pampering for all they do. It's that much easier to treat your hands and nails to a bit of TLC with Dermalogica Multivitamin Hand & Nail Treatment and Formula X Full Strength Treatment Nail Polish. Together, they're the perfect recipe for happy hands! I'm kind of terrible when it comes to using hand cream. Mainly because I don't get along well with anything that leaves a film of 'feel' on my hands. I have stuff to do and don't want to have to wait for my hand cream to absorb. That is no issue (at all!) 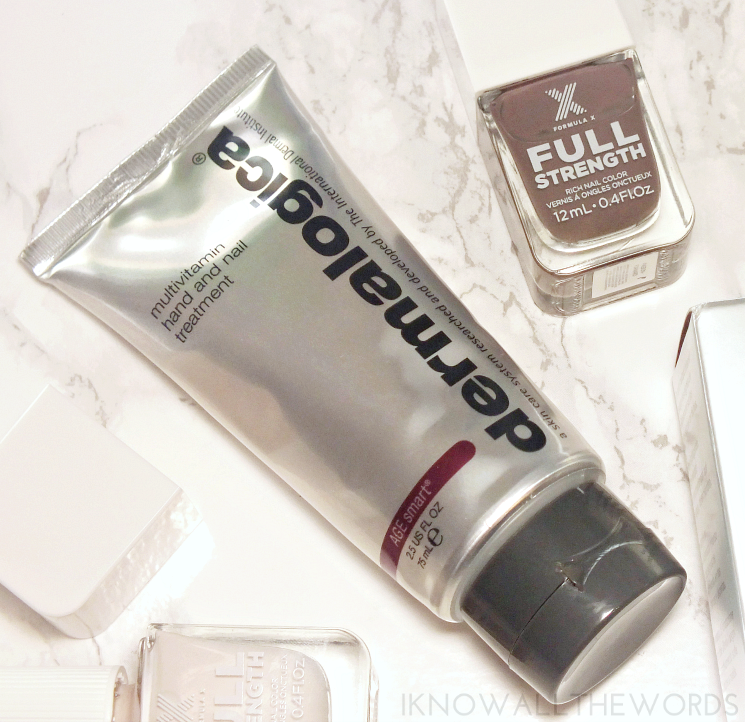 with the Dermalogica Multivitamin Hand & Nail Treatment. This is the hand cream, sorry, treatment of my dreams. Scented with all natural grapefruit oil, it has a fresh, uplifting scent and an instantly hydrating formula that sinks in and virtually disappears. The cream has a thick-ish texture, but isn't heavy feeling and leaves hands feeling silky and nails nourished and protected (with prolonged use the treatment helps prevent peeling and weak nails) thanks to the blend of vitamins and algae. "Full Strength's breakthrough gel-based nail polish formula fuses rich, opaque color with a high-performance botanical treatment. It features an innovative base formula with Natural Flex Polymer™, a flexible mesh of plant-based proteins saturated with rich pigment to create a shock-absorbing finish. When dry, this nail polish acts as a protective cushion, “flexing” with the nail for maximum protection against chipping and breaking. Full Strength is fully loaded with the same botanical boosters as bestselling Formula X Sheer Strength for ultra-nourishing treatment. Fortify nails in a versatile array of statement brights, elegant bolds, and understated neutrals while protecting them and making them appear thicker." My nails range from strong and healthy to peeling and delicate, so I try to treat them well whenever possible. 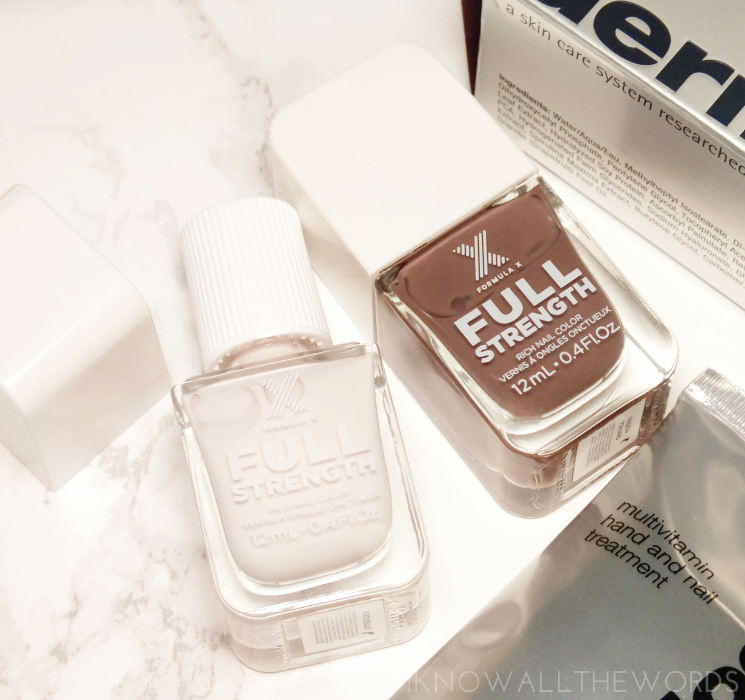 That's gotten a much easier with the new range of Full Strength Treatment Nail Polish from Formula X. The line combines the treatment cocktail found in the Sheer Strength line (a line of sheer tinted treatments) with opaque colour. The line is currently limited edition and only home to ten shades, but jump now. They're pretty great. Of the ten shades, I've worn Statuesque, a lavender-kissed white, and Passion Forward, a plummy-brown. Passion Forward is a bit of a chameleon, as it changes in different lighting situations. In some light it's a plummy taupe, while in others a plummy chocolate. Both shades have excellent formulas (albeit a bit thick) that apply in two coats and dry to a glossy, protective finish thanks to the gel-finish formula. I tested these without base coat or topcoat and was incredibly impressed at how well they wear. You might know that all nail things (treatments, polish, you name it) tend to chip easily on my nails, but I had five full days of wear with only the tiniest chip. As I haven't done extensive testing, I'm not certain if the formula is truly making a difference in my nails, but the promise of stronger nails is mighty appealing, and I do find the finish to be not only long-lasting but durable enough to at least physically protect my nails from damage and breakage. Overall, two products I'm most certainly loving! Have you tried either? Want to? Do you have any go-to products to keep your hands happy?